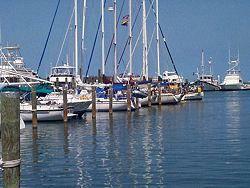 Key West”s charm and beauty draws a wide variety of people to this small island. 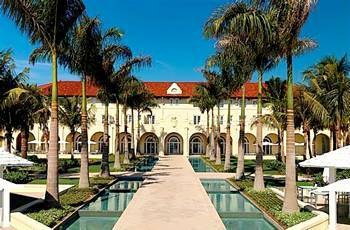 The historic architecture and unique atmosphere sets this place apart from the rest of Florida. In fact it has such a particular flavor in the air, one is lead to believe they have arrived at fairy-tale come true. On this tropical island the weather never gets too cold–frost is simply unheard of–and the continual breeze that comes directly off the ocean prevents the island from getting too hot. The average annual temperature of 77 degrees rarely varies more than 10 degrees in either direction. The ocean breeze also keeps the air quality to be some of the best in the country. Divers, snorkelers, fishermen and people who just love the ocean will not be disappointed with the glorious waters of Key West. Off the Eastern and Southern shores of the Florida Keys, in a band over 200 miles long, lies a subtropical ecosystem of mangroves, seagrass and coral reef communities. Approximately 6,000 coral reefs line the waters between Key Biscayne and the Dry Tortugas. The waters around Key West are a National Marine Sanctuary created to protect North America”s only living coral reef. 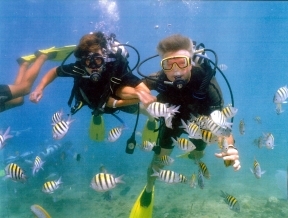 In many areas, the reef is so close to the surface that it can be enjoyed by snorkelers, or seen through a glass bottom boat. People who dive will find an endless amount of joy exploring the reef at deeper levels. Shipwrecks can be found in depths from 30 to 90 feet. As the living coral reef provides shelter, food and breeding sites for a variety of plants and animals and is the most diverse marine ecosystem in the world, the waters around Key West are simply exploding with fascinating marine life. Both Dolphins and manatee can be seen swimming about if the moment is right. The shores of Key West are lined with the celebrated Mangrove forests, which stabilize the shoreline as well as provide there own interesting marine and animal habitat. For the sports fisherman, there are 225 species of game fish that live in the blue waters of the Florida Keys. 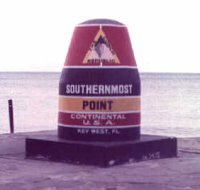 The best part of Key West is that after a day of captivating water activities, you return to a town vibrant and ready for fun. Just before sunset everyone heads down to Mallory square to share the dramatic spectacle of the sun going down over the Gulf of Mexico. After which artisans, musicians and street performers can be found in abundance, as people pour out from the pier into the many restaurants, bars and clubs. Every year at the end of October, Key West opens its doors to thousands of visitors to celebrate “Fantasy Fest”. The festival is similar to New Orleans”s Mardi Gras; the occasion is marked with a parade, wild and often exotic costumes, music, dancing, good cheer and lots of people looking to enjoy themselves in a beautiful setting. The festival has a different theme each year, and since crowds can get up to 55,000 people, it is a good idea to plan way in advance! 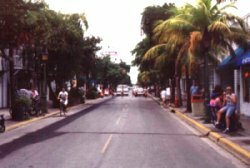 Key West has as many different personalities as it does visitors. Though the vibrant social scene draws many people, so does the relaxed beauty of the town. Austere, historical houses line the quiet streets, while coffee houses and theaters add a creative element to the atmosphere. Over the years famous writers and poets and artists have chosen to make the island their home. 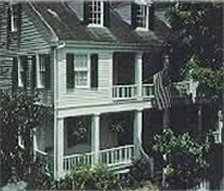 Although Earnest Hemmingway”s presence is still felt most keenly, such notables like Tennessee Williams, Elizabeth Bishop, John Ciardi, John Hersey, Richard Wilbur, Philip Caputo and many others have all helped to give the island its reputation for being a place for creative people to gather. Key West is truly inspirational.